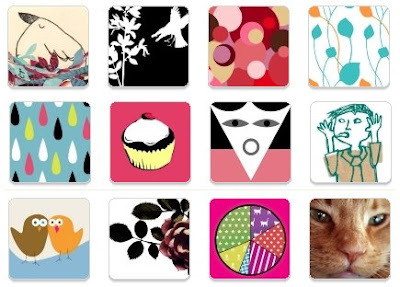 do you remember a few weeks ago we featured a competition to design a laptop sticker for moo. well here are some of the winning entries. unfortunately they are not credited so we dont know whos done what, but maybe yours is here ? click moo to see the full collection of 90. Mine is the pink DUCK biscuit. I found out about the Moo's Sticker Competition on Print & Pattern, so I'm very excited to see one of my winner stickers featured here! Thanks bowie! Mine is the knitted monkey in the first section! Thanks for featuring the Moo Sticker winners. Very exciting to see my winning sticker on your blog. Great blog btw. Love reading about and seeing all the prints that are out there. Thanks Bowie! i love the knitted monkey, and the gnome & duck biscuit too. i also see now that the three 'birds on a hand' sketch are by kate seaward. ahh :) mine is the black and white one in the second half with a crocobird on it :) i found out about the competition via your blog and it's exciting to see my sticker in it now :) thanks! yep the pink lovebirds are mine...and the cat with shades and bonjour moustache are Gemma Corrells...my fellow fine city friend!